Preheat oven to 325° F. Grease a 9” springform pan, covering the bottom with greased parchment paper. In a mixer, cream the butter with 1/3 cup sugar. Add the egg yolks one at a time, mixing well between each addition. Mix the chocolate and nuts and add to mixture. Stir in almond extract. Remove from the mixer and fold in the cocoa and flour. Whisk the egg whites until stiff, then add the remaining sugar and whip until stiff peaks are formed. Fold the egg white mixture into the batter. Bake for 60-70 minutes or until top is firm and tester comes out clean. Cool and remove from the pan. Warm the apricot jam until liquid. Spread over the top and sides of the cake. Allow to cool and set slightly. Meanwhile, melt the chocolate and butter together. Place cake on a rack over a lipped cookie sheet. Pour the chocolate mixture over the top of the cake to coat evenly. Allow to cool until icing is set. Refined Starbucks® coffees such as Sumatra, Guatemala Antigua and Sulawesi are best paired with the classic sacher torte. Its rich, buttery texture compliments the chocolate undertones. Even more delicious is how the intensity from each coffee holds up to the fruity tang of the torte. Preheat oven to 350° F. Butter and flour two 9” cake pans. In a medium bowl, combine cocoa and water until smooth. Cool to room temperature. In another bowl, combine eggs, cocoa mixture and vanilla. In a large bowl, combine dry ingredients. Add butter and remaining cocoa mixture and mix on low for 30 seconds. Once combined, increase the speed to medium and beat for 2 minutes. Add the egg mixture in three batches, scraping between each addition and mixing until well combined before the next addition. Pour into the prepared pans, smoothing if necessary. Bake 20-30 minutes or until tester comes out clean. Cool 10 minutes, remove from the pans and allow to cool completely. Whip the cream and powdered sugar until stiff peaks just begin to form. To assemble the cake, place one layer of the chocolate cake on a plate. Place 1/3 of whipped cream on top and spread evenly. Place half the cherries randomly in the whipped cream. Top with next layer and frost entire cake with remaining whipped cream. Arrange remaining cherries on top of the cake and garnish by sprinkling chocolate shavings over the cherries. Bold, intense flavors of Arabian Mocha Sanani and French and Italian Roasts need a strong dessert partner. The Black Forest takes the cake with equally bold attributes. The fruit in the dessert enhance the bold components in each of these coffees. Moreover, its rich chocolate, sweet cherries and light cream bring the powerful duets together in sumptuous harmony. 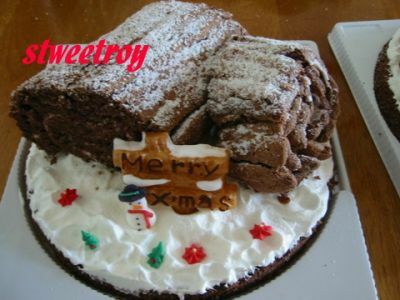 This is my SG net friend, LeeLee\’s recipe but I did a little modifications. 1. Crushed digestive biscuits and mix well with melted butter. 2. Press into a 8” cake pan. 3. Refrigerate for 30 minutes for later use. 1. Put all the ingredients into a pot. 2. Doubleboil over small fire until gelatine is dissolved. 3. When it is a little cooled, pour it into cake base. 4. Chill it for 10 minutes, then add the shaped mango pieces. Put it back into the refrigerator to chill for another 15 minutes. 1. Boil all ingredients until dissolved. 2. Pour cooled mango jelly solution gently onto marshmallow layer by big tablespoon. 3. Chill in the refrigerator for 3 hours till jelly is set before serving. 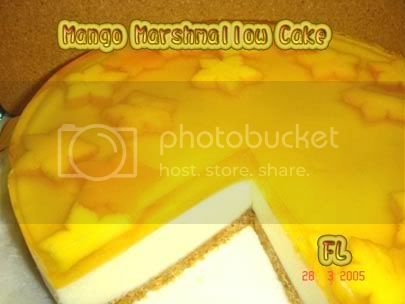 You can also arrange some sliced fresh mangoes on the biscuit base just before pouring in the marshmallow and also on top of the marshmallow layer. You can also add in diced mango pieces into marshmallow mixture. I shaped the mango pieces with a cookie cutter.